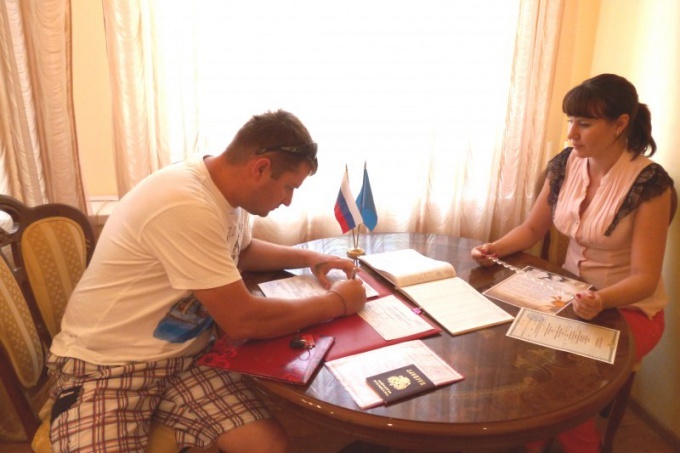 The registry office people visit not only on festive occasions - to apply for a marriage or to birth certificate of the child, but after the sad event - for registration of death certificate and registration of divorce. So the registry office could accept the statement on marriage, the bride and groom must bring passports. And one of them must have residence in the area where is located the registry office. Nonresident may apply only at certain registry offices, or to register. A statement from the alien may be accepted only if it has the registration in the desired area. In addition, you must pay the state fee for marriage registration and bring the receipt to the Registrar. On reflection at the registry office the given month. If you want to sign early, you can bring a certificate of pregnancy, a summons from the military Commissariat or other documents proving that one of the future newlyweds can't wait for the due date. A birth certificate can be obtained within one month from the date of birth of the child. It is issued only in the office of the Registrar at the place of residence of one of the parents. You need to have a certificate from a maternity home, a passport and a certificate of marriage. In that case, if the child officially has no father, mother is not married, the birth certificate in the right column put a dash. If dad is there, but the marriage is not registered in the registry office an act to establish paternity. During the procedure, both must be present parent. To obtain a birth certificate of a child later than in a month, it does not threaten. But without it you cannot register the child's place of residence, and here the delay will result in a fine. - the verdict of condemnation not present the spouse to a term of imprisonment of three years or more. If the spouses have children together, divorce is most likely to occur through the courts. When it is served the statement of claim, provided the marriage certificate and child birth. In addition to these documents you need to bring the receipt of payment of fee for registration of divorce. A death certificate is issued in the office of the Registrar of the district where he was registered dead person. To register the document will need his passport and death certificate. Passport must be the one who applies for a certificate. Passport of the deceased and help climb the Registrar, in return, issued a death certificate.